MRI Simulator - Simulates an MRI image of the brain based on user selected sequences and parameters including TR (time to repetition), TE (echo time), FA (flip angle), and TI (inversion time). Elbow Ossification Centers - As you scroll through elbow radiographs of children from 5 months to 11 years of age, the ossification centers appear in the order of the CRITOE mnemonic. Shoulder and Knee MRI Flashcards - Basic level. G. Stetten, W. Weiser, D. Wang, J. Galeotti, D. Shelton, Combining Tomographic Images In Situ With Direct Vision In Sterile Environments, US Patent 8,211,020, issued July 3, 2012. Q. Wen, X. Jiao, F. Kuang, B. Hou, Y. Zhu, W. Guo, G. Sun, Y. Ba, D. Yu, D. Wang, F. Zhang, H. Qiao, S. Wang, S. Tang, H. Qiao, FoxO3a inhibiting expression of EPS8 to prevent progression of NSCLC: A new negative loop of EGFR signaling, EBioMedicine. February, 2019. S. Swan, I. Lennes, N. Stump, J. Temel, D. Wang, L. Keller, K. Donelan, A Patient-Centered Utility Index for Non-Small Cell Lung Cancer, MDM Policy & Practice, October, 2018. D. Wang, V. Deeney, J. Roach, A. Shah, Imaging of Physeal Bars in Children - A Pictorial Review, Pediatric Radiology, March, 2014. D. Wang, A. Ghodadra, R. Rasmussen, S. Tadros, Watch Your Child's Elbow Grow, Radiological Society of North America Annual Meeting, November, 2013, Chicago, IL. D. Wang, S. Golla, C. Britton, Spectrum of Pigmented Villonodular Synovitis, Association of University Radiologists 61st Annual Meeting, Apr 9-12, 2013. D. Wang, B. Casagranda, K. Tung, C. Britton, Osteolytic Processes of the Hand and Wrist, Radiological Society of North America Annual Meeting, November, 2012, Chicago, Illinois. K. Tung, D. Wang, C. Britton, The Many Faces of Fibrous Dysplasia: Its Features and Osseous Lesions it May Mimic, Radiological Society of North America Annual Meeting, November, 2012, Chicago, Illinois. D. Wang, K. Tung, A. Haldipur, E. Kanal, Understanding MR Imaging Parameters, American Roentgen Ray Society Annual Meeting, May, 2012, Vancouver, Canada. D. Wang, A. Haldipur, E. Kanal, Mastering MR Imaging Parameters, Radiological Society of North America Annual Meeting, November, 2011, Chicago, Illinois. N. Amesur, D. Wang, W. Chang, D. Weiser, R. Klatzky, G. Shukla, G. Stetten, Peripherally Inserted Central Catheter Placement by Experienced Interventional Radiologist using the Sonic Flashlight, Journal of Vascular and Interventional Radiology, 2009; 20: 1380-1383. D. Wang, R. Klatzky, W. Bing, G. Weller, A. Sampson, G. Stetten. Fully Automated Common Carotid Artery and Internal Jugular Vein Identification and Tracking using B-Mode Ultrasound , special issue on Neuroimaging in Geriatric Psychiatry, in IEEE Transactions on Biomedical Engineering, Vol. 56, No. 6, June 2009. D. Wang, N. Amesur, G. Shukla, A. Bayless, D. Weiser, A. Scharl, D. Mockel, C. Banks, B. Mandella, R. Klatzky, G. Stetten, Peripherally Inserted Central Catheter Placement with the Sonic Flashlight: Initial Clinical Trial by Nurses, Journal of Ultrasound in Medicine, 28:651-656, 2009. D. Wang, Automatic Common Carotid Artery and Internal Jugular Vein Identification and Tracking for the Sonic Flashlight, Ph.D. dissertation, Department of Biomedical Engineering, Carnegie Mellon University, advisor G. Stetten, April, 2007. D. Wang, NB. Amesur, RL Klatzky, A. Bayless, B. Mandella, C. Banks, G. Shukla, G. Stetten, Peripherally Inserted Central Catheters by Nurses using the Sonic Flashlight , Clinical and Translational Science, UPMC, Pittsburgh, PA, May 17, 2007. D. Wang, NB. Amesur, D. Weiser, WM. Chang, AB. Zajko, G. Stetten. Improving Image Quality for the Sonic Flashlight in Sterile Procedures. The 57th Annual Convention of the American Medical Student Association, March 7-11, 2006, Washington, DC. D. Wang, R. Klatzky, N. Amesur, and G. Stetten, Carotid Artery and Jugular Vein Tracking and Differentiation Using Spatiotemporal Analysis, Medical Image Computing and Computer-Assisted Intervention (MICCAI 2006), Lecture Notes in Computer Science, vol. 4190, pp. 654-661. 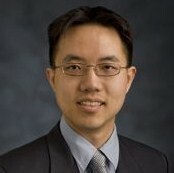 S. Clanton, D. Wang, V. Chib, Y. Matsuoka, G. Stetten, Optical Merger of Direct Vision with Virtual Images for Scaled Teleoperation, IEEE Transactions on Visualization and Computer Graphics (TVCG), Vol. 12, No. 2, March/April 2006. W. Chang, NB. Amesur, D. Wang, A. Zajko, G. Stetten. First Clinical Trial of the Sonic Flashlight - Guiding Placement of Peripherally Inserted Central Catheters, 2005 meeting of the Radiological Society of North America, November 2005, Chicago, Illinois. Paper Number SSJ03-02. D. Wang, R. Tamburo, G. Stetten, Cumulative Gaussian Curve Fitter for Boundary Parameterization, Technical report in special MICCAI 2005 Workshop on Open-Source Software issue of The Insight Journal. D. Wang, W. Chang, G. Stetten, Real-Time Ultrasound Image Analysis for the Insight Toolkit, Technical report in special MICCAI 2005 Workshop on Open-Source Software issue of The Insight Journal. D. Wang, B. Wu, G. Stetten, A Laser Needle Guide for the Sonic Flashlight, Medical Image Computing and Computer-Assisted Intervention (MICCAI 2005), Lecture Notes in Computer Science. Sonic Flashlight - Video shows Sonic Flashlight being used on a blue gel phantom to guide needle placement into a simulated vessel. Video also shows Sonic Flashlight being used on an upper arm, showing underlying muscular structures. .
Carotid artery and jugular vein tracking (video 1) and (video 2) - Videos show automatic identification, tracking, and color labeling of the common carotid artery and internal jugular vein in real-time ultrasound scanning.